Did you know that poor dental care for pets can cause other health problems? Did you know that other health issues can cause dental problems for your pet? Your pet’s teeth and gums should be checked by your veterinarian at least once each year. This will help them to spot problems early on and keep your pet’s mouth clean and healthy. When you choose a vet clinic or hospital for your primary pet care, make sure to choose one that offers a wide range of services, including canine and feline dental care. Don’t be afraid to ask questions and learn new ways to keep your pet’s teeth and gums clean between visits. You might be surprised to find out that canine dental care and feline dental care are available at your local Dartmouth vet hospital. Dental care for pets is an important part of keeping them healthy throughout their entire lifetime. New Bedford pet owners, as well as pet owners throughout the South Coast region, can come to Anchor Animal Hospital in Dartmouth, Massachusetts for top quality, affordable dental care for their pets. You’ve probably seen the toothbrush and toothpaste cleaning kits on the shelves of your local pet store. 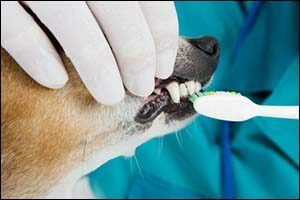 Veterinary dentistry takes the basic idea of keeping your pet’s teeth clean to a whole new level. It is much like the dental work that you could get done at a professional dentist’s office for humans. Veterinary dentistry is performed as part of an overall plan for dental care for pets by a board certified veterinary dentist. What that means is that this person has the education, training and knowledge to perform a wide range of dental procedures according to state and federal regulations. Veterinary technicians can perform basic types of feline and canine dental care, such as brushing and training people how to clean their pets’ teeth. New Bedford pet owners should know that at your first visit to our Dartmouth vet hospital to receive dental care for pets, we will start by providing your pet with a complete oral exam by the veterinarian. X-rays might be needed to inspect your pet’s jaw, teeth and roots below the gum line, which is where most dental disease occurs. A complete and thorough cleaning and evaluation will typically be performed under anesthesia, and can including scaling to remove tartar and plaque, polishing and other required procedures. What Causes Dental Issues in Pets? While canine and feline dental care rarely includes filling cavities, as pets do not – or at least should not – consume as much sugar as people, they still require a lot of dental care for pets that will seem familiar to you. Taking good care of your pet’s teeth should be a priority. New Bedford pet owners should ask their veterinarian about dental hygiene, home brushing and other things you can do to protect your pet’s teeth. Periodontal disease, infected or abscessed teeth, palate defects, cysts or tumors in the mouth, alignment issues and even broken teeth can be seen regularly in pets due to chewing on toys, rough play or even health issues. Periodontal disease is serious, as it won’t just affect your pet’s teeth and gums. Dental care for pets is important to prevent the development of periodontal disease, as it can cause other health problems and disease of the heart muscle, liver and kidneys. Plaque is the first step of periodontal disease. If it isn’t removed, it turns into plaque and any tartar that forms below the gum line can cause infection and damage to the jaw bone, as well as any tissues that connect the teeth to the jaw. Regular check-ups at your Dartmouth vet hospital can help to spot small issues before they become big problems. New Bedford pet owners and pet owners throughout the Southeastern Massachusetts and Rhode Island region should schedule an appointment at their local Dartmouth vet hospital for a veterinary dental examination. Give us a call at 508-996-3731 to make an appointment for feline dental care or canine dental care as part of your commitment to overall dental care for pets. If you have any questions about our procedures or want to learn more about our practice, please call and speak with one of our friendly staff members.